We’ve all heard about Trojan Horses in relation to computers and viruses, and we know that we must do everything within our power to avoid them! Antivirus software is big business but these days with the right level of security software it’s easier to keep ourselves protected. So where did the name ‘Trojan Horse’ originate from? The story comes from Greek Mythology, when the Trojan War was declared in the city of Troy by the Greeks, in order to avenge the taking of the King’s wife by Paris of Troy. The war features in many works of Greek Literature and poetry, and famous in Homer’s Odyssey and Iliad. The Trojan Horse was constructed by the Greeks after 10 years of fruitless siege, in order to end the conflict. 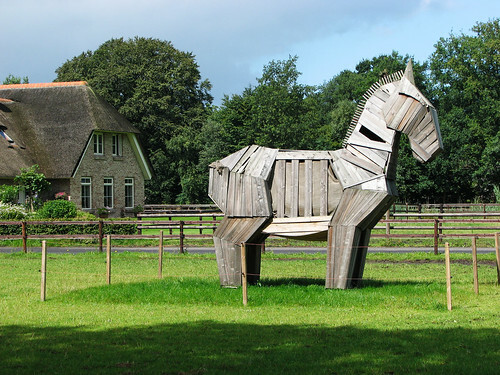 They built a massive wooden horse which a handful of strong men hid inside. The Greeks left it and the Trojans took it, pulling it back into their city as a sign of victory too much applause. Later that night, the Greek men climbed out of the horse and unlocked the gates so that the Greek army could enter the city. This was their trump card – the Greeks blighted the city of Troy and claimed victory for themselves. The war was won! A ‘Trojan Horse’ has come to be used as a metaphor for any trick that tempts a target to let their enemy into a secure area it’s a strategy that is still used in war today. And not just in war either – with the advent of computers, hackers have used it as inspiration to create viruses that ‘piggyback’ your computer and use it to infect lots of other ones. Metaphorically, little bugs are ‘hiding’ themselves within your emails and files, and then, appearing trustworthy, they are granted access to many more computers. And How Can I Avoid Them? The right level of security software will help to protect your computer from getting infected, however it’s advisable to avoid any dodgy-looking sites and clicking on any links from sources that you don’t trust. Key offenders are pirate download sites. Don’t open emails from people that you don’t know and always be on the lookout for a scam. Hackers are getting clever these days and it’s much harder to spot a bogus email than it used to be. If you are not sure, don’t take the risk. Use search engines that you trust as well -�you will stay a lot safer. There are plenty of software programs available to download, some for free, that will wage war on your computer viruses. But if you’re not sure then it’s always better to ask an expert who can help you out. Trojan Horses very rarely signify the death of your computer but it’s essential you do everything within your power to get rid of them as soon as possible. The longer they are at work, the more damage they will do. Not just to your computer but to lots of other ones too (including all of your contacts). The bugs may win the battle, but you’ll win the war! Author Bio: The author of this post, Jessica Stone, has a keen interest in the field of IT and keeps close tabs on the latest developments and breakthroughs, especially with regards to spyware removal. She works with TechSeek, providers of excellent PC repairs in Melbourne.